I actually enjoy this camp, it's pretty easy as a 93 raid geared bard to tear through, even when I was SS/MC group geared at lvl 90 it wasn't bad at all. I have camped this three times, each time taking me only a matter of hours to get it (usually around 6 or 7 hours total), and for those who are dreading it, it's not bad if you keep yourself occupied by farming plat from surrounding giants after killing PH'ers. Just my two cents. The click effect to summon the blades says req. 70 but I cannot get the click to work on my 70 monk. I have tried clicking it from inventory, from the range slot, and from the ammo slot, I get the "you are not sufficient level to use this item" every time. So methinks you have to be the req level of the item before the click will work. If that's how it has always been with items that have a clickie level lower than the item's req level to use then I apologize for this post. Just wanted to add that I got my pouch after hunting here, DSK, and Stoneroot for their clickies for about 5 or 6 months off and on. A friend needed a named mob so we came to kill him, then went over to Citadel, popped Jotik and theres my pouch!! <<<FINALLY>>!! I remember camping outside where the mob spawns that drops this wonderful clickie. We weren't even there for that mob, and were basically just looking for any named mobs in that area and just killing Giants in general, when Jotik the Guardian spawned and I noticed it dropped the Guardian's Pouch. Another Warrior I was grouping with said he was waiting a week for it to drop, but to be fair we rolled for it, and lucky me I won the roll, and ended up ruining the other Warriors day, and then another week because it didn't drop for a very, very long time. And I have never been happier with a click bag to summon daggers that have great range and some decent damage. I never had done throwing up until that point, but quickly got it maxed out since I no longer had to make arrows anymore! This goes into ranged slot or can it be used in the ammo slot as well? I really don't want to give up my nice range item for this. 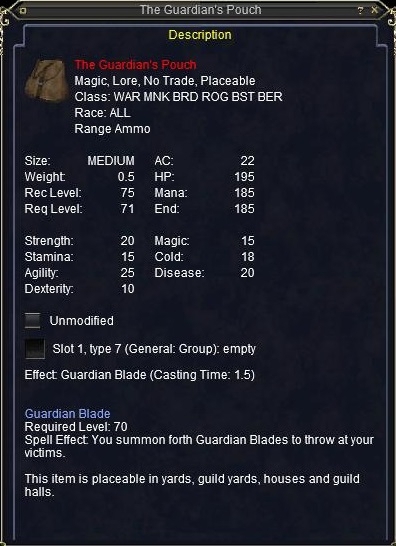 Or is it equpped in ranged, then used to summon and then put blades into ammo? As with other ammo summoning clickies, the ammo summoned must go in BOTH ammo AND range slots to be thrown. The ammo slot does NOT give any statistics, though. This means that you have to put the pouch in your ammo or range slot, use the clicky, and swap out the pouch AND your range item for the ammo created in order to throw things. What I would do in your position is, if you actually USE the throwing skill like I do on my Monk, make a bandolier that you use for throwing with the ammo in both slots. Then, in your other bandoliers that you want your nifty range item in, put the pouch in the ammo slot for qhich clicking. When you need to throw something, click the throwing bandolier, and switch back when you need your other stuff. IMO Bando is a must (until you have graduated to click pulling some would say anyway). I prefer to rotate the ammo and not the bag though (A modern stack lasts long enough, and you can free up an extra space that you have reserved if you get full by surprise). If you even get tired of that, believe it or not on constant pulls for long periods you will, that's when the better the actual throwing item is (stats-wise) the less you will lose from your even better normal range item comes to be desired. Minor corrections: 1) you don't "have to put the pouch in your ammo or range slot" you can cast it from inventory as well for instance (See description). 2) You don't have to put "ammo in BOTH" to throw (1), of course you do if you want them to auto feed though. Now if I could figure out how to get the Bandy to move the whole partial stack back in. I guess I was lucky then. 3 placeholders, 1 Jotik, 1 pouch.